This is my After. I didn’t buy anything. I used two 1/2 cans of blue paint to make one can and I had everything else…the fabric, spring curtain rod & cork board. I had the basket and spray painted it black. Oh…and the floor is NOT hardwood, it’s those peel and stick vinyl planks that I’ve talked about. I just did it over the old linoleum. Easy Peasy! I had the canvas and just painted it…got the cute idea from Bienvenue. Sorry…I won’t be hosting the giveaway this week…but in a coupla weeks…just in time for Valentine’s! 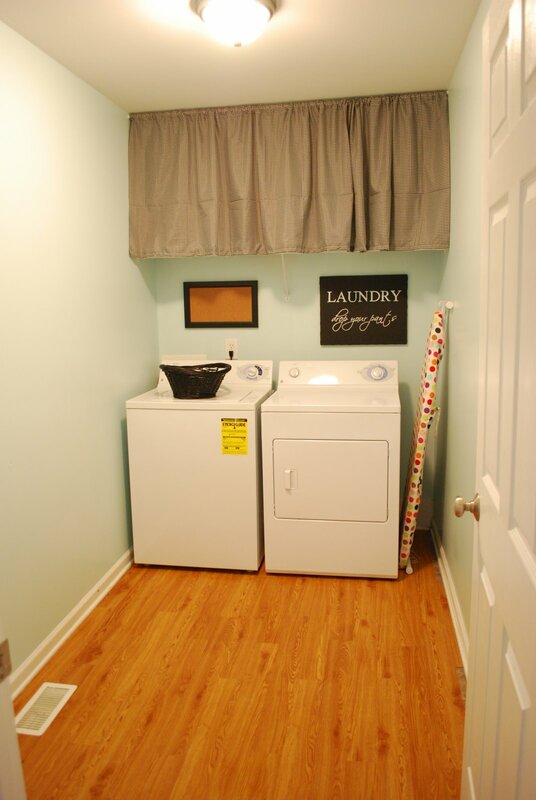 Cute laundry room…love your paint color! I love that you didn’t buy anything! It looks fabulous! fantastic redo. I was loving your hardwood floors-can’t believe they are peelandstick tiles.Your zebra chair makeover is great too. 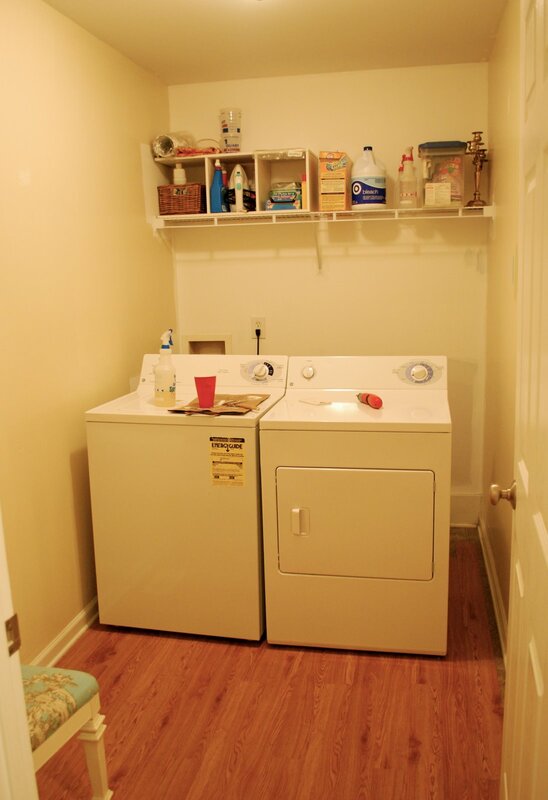 Your laundry room looks so fresh and cute! I love the flooring too! It looks great, and Susies’ sign is adorable!! this is a great revamp!! i can’t wait to see more!! I love it!And if you don’t pull that yellow sticker off of your washer I’m gonna come and do it for you! When ever I see a sticker I have to peel it. It’s a sickness. Very cute! It’s amazing how a little paint, etc. can make such a huge difference. Great job. So soothing – looks great! wow. i don’t know if i could ever be that cutesy with a room i wouldn’t even be able to organize. it looks great! did you stencil the sign or is it free hand? i love it either way. Oh what a fresh clean makeover. I think mine may be a tinge more work. I kinda want paint the cabinets, but can’t seem to find the time. I love it all…especially the sign. Seriously, the sign! How did you paint that so perfectly? I have tried to use a paint pen to do signs but they NEVER turn out as nice as yours. Love it! Elena,I’ve been painting signs for awhile now and the best way is to use transfer paper or in this case, I used white graphite paper. Look at the “how to” over on the right side of my blog. Click on ‘Paint a monogrammed sign’ and there is a tutorial. Good luck! and let me know if you have any questions. Jill,I was a surgeon in my previous life…just kidding. i go slow and it takes some time…i messed up a coupla times on this one, but used a black paint pen to fill in the mess. just practice on some scrap wood. And it looks better from far away…if you came in and examined it like my friend Tina, you would find all the flaws…seriously! Just play! Awesome! That’s my kind of makeover, no cost, all creativity. Congrats on a job well done. ok…sticker police…i have rendered the sticker problem. no more sticker evidence! Love it. Love it. Love it. And I like your sense of humor too. Now, I’m off to buy a two canvases, one for my practice and one to hang above my washer. Just found your blog. What a great transformation. I seriously need to work on my Laundry room! Great Laundry room re-do! Love the sign too! It looks wonderful. A few simple changes really made it more cozy! 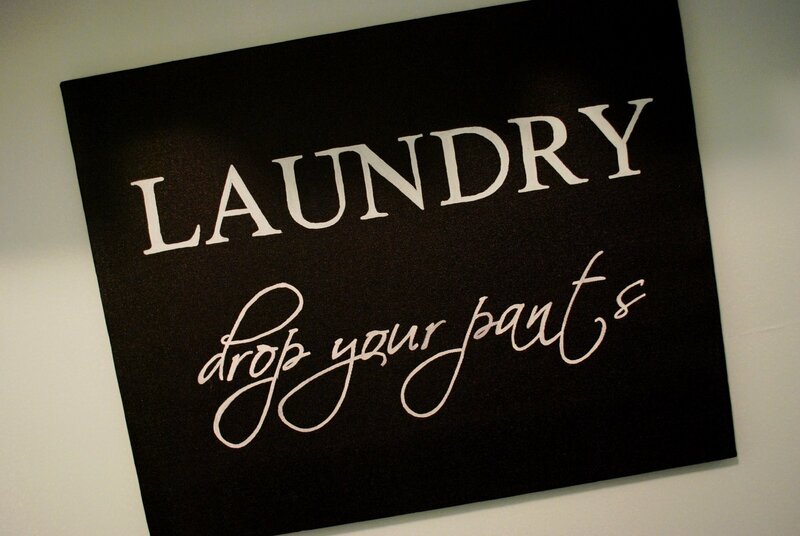 Oh how I wish I could make my laundry room a happier place to be. But, alas, it is in our garage, so instead, I just look at the cars and the water heater while I put my loads in. 😉 Someday I hope to have a laundry room I can decorate! Looks so clean and inviting! Doing laundry is so much more fun when you have a pretty room to do it in! 🙂 Love it! This is so pretty!! I would love to have it… Heck, I would take the before even if you left all the stuff in it! I’m posting about the hideousness that getr a slim pass to be called our laundry room either tonight or this weekend. I’m soooo desperate for some free ideas because ours is nasty and my husband would die if I asked for some money to revamp it! fabulous! love how the curtain hides all the shelves…clutter on my laundry room shelves drives me CrAzY but it's all necessary stuff…must try this. love how the blue makes it so calming, too. love your taste.